The Gibson Hummingbird Acoustic Guitar is played by Jack White throughout the Cold Mountain soundtrack. "Caleb plays a Hummingbird, this is a nice guitar. He just got it not too long ago in Australia. It's deep and rich. Gibson hooked us up," explains Caleb Followill's guitar tech around 2:19 into this video. In this photo, Auerbach can be seen playing a Gibson Hummingbird. In this video, Dave Grohl is performing an acoustic version of *Everlong* for the first time ever, live on the Howard Stern Show in 1997. He is using a Gibson Hummingbird acoustic guitar in a natural finish, as evidenced by the pickguard shape and designs, fretboard pearl parallelogram inlays, and headstock (seen somewhat clearly at 1:24 into the video). Sheryl Crow uses a Gibson Hummingbird for acoustic work. In this video, Nick McCarthy can be seen playing a Gibson Hummingbird in an unplugged with Franz Ferdinand at Music Feeds Studio. Keith can be seen in this image playing a Gibson Hummingbird. Gibson writes [in this article](http://www2.gibson.com/news-lifestyle/features/en-us/gibson-hummingbird-guitar-1203.aspx) "Or, depending on your taste in guitar heroes, the foundation of the Hummingbird mystique may have been laid by Keith Richards. He has preferred the ’Bird as his acoustic guitar of choice since 1964, and the model has fueled such famous Rolling Stones cuts as 'Street Fighting Man,' 'Not Fade Away,' 'Brown Sugar,' 'Angie,' 'Wild Horses' and 'Jumping Jack Flash.'" In this video, at 3:05, Bono can be seen playing a Gibson Hummingbird in a wine red finish. "Two behind the flagship that is the J-200 this guitar has a very balanced sound and is great for recording. Very few maple back and side versions were made in this period that overlapped the Dove model. This guitar can be heard on the Sloe Gin album on a song called…'Around the Bend,'" Joe Bonomassa says, on his [website](http://jbonamassa.com/joes-guitar-of-the-week/joes-guitar-of-the-week-16-1966-gibson-hummingbird/). This guitar actually belongs to Thom, but he used at the Haiti Benefit show for Faust Arp. 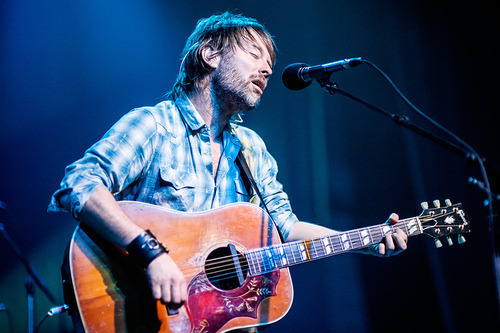 Thom is using a Gibson Hummingbird in this photo. Taylor Swift's acoustic guitar of choice on this performance on The Ellen Show is a Gibson Hummingbird Acoustic-Electric Guitar. She plays a duet with Zac Efron. At the 1:18 mark, they begin playing an acoustic cover of the song *"Pumped Up Kicks"* by the group [Foster The People](http://equipboard.com/band/foster-the-people). The video is dated February 2012. Soundgarden's Chris Cornell can be seen playing a Gibson Hummingbird in this video for Like a Stone. Waits can be seen playing a Gibson Hummingbird in this photo. In 2002 Adams used a Hummingbird during his AOL-Session. Jack Black can be seen playing this Gibson Hummingbird quite often. At the beginning of this performance of "Ice Cream Man" by Van Halen, Roth can be seen with a Gibson Hummingbird. Tom Pettys Gibson Hummingbrid is no usual one. It shows some very special features, which propably make it a one of a kind Guitar. It has the "upside down belly bridge" with an adjustable ceramic sadlle. That would sugest being from between 1965 and 1970. But the neck is very out of the ordinary. It has the very unusual big block inlays and is bound with the spike at the soundhole like the neck of a J200. The conclusion would be that either somebody changed the neck of a late 60s Hummingbird for a J200 neck and added the big block inlays or it is a very rare prototipe. Sadly there is pretty much no info about it online. It has a beautiful honey sunburst and he used a LR Bags magentic soundholepickup on it. He can be seen unsing it on multiple live performances for songs like Wildflowers and in studio, so it is probable that he also used it for recording songs like Wildflowers. Gallagher didn't play much guitar with his time at Oasis, but he was seen couple of times with this Hummingbird model. Used by KT at Camp Bestival '16. "Ninety-eight percent of them are Gibsons. Everything from old J-200s to Hummingbirds to all the Les Pauls I have. When it comes to writing the rock stuff, I use Les Pauls, because I love the beefy tone to them," says Corey Taylor, in [this interview](http://www2.gibson.com/News-Lifestyle/Features/en-us/Interview-Corey-Taylor-Talks-Guitars.aspx). In this photo, one can see Jagger using a Gibson Hummingbird. 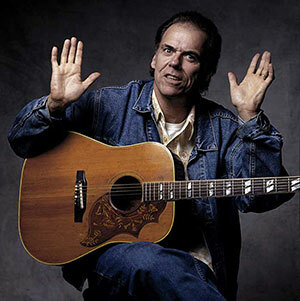 Duvall plays the Gibson Hummingbird for many acoustic performances such as Nutshell in the video shown. Lynne can be seen in this photo in a Guardian article playing a Gibson Hummingbird guitar in natural finish. In this photo, Iha can be seen playing the Gibson Hummingbird acoustic guitar. On this picture Hiatt can be spotted with a Hummingbird. In some shots you can clearly see the Humminbird's typical pickguard and the Gibson inlay. Katy Perry with her Gibson Hummingbird. In this video for Black And White America, Lenny Kravitz can be seen playing a Gibson Hummingbird acoustic guitar. At 1:34 in this music video of the song "Scare Away the Dark", there is clear shot of the Gibson Hummingbird guitar Passenger is playing. Shawn can be seen playing what looks to be a Gibson Hummingbird throughout this video. In this photo, we can see Caillat playing Gibson Hummingbird. At 0:39 in this video of the song "Love Yourself", there is clear shot of the Gibson Hummingbird Ebony guitar Justin Bieber is playing. A black Hummingbird can be seen in this image of Blake with Miranda Lambert. 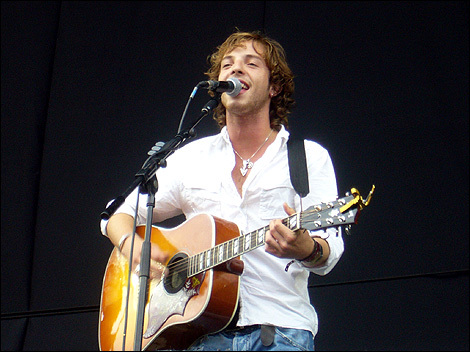 "I’ve always played Gibson acoustics—Hummingbirds, Sheryl Crow models, and Songwriter Deluxes." - excerpt from her Gibson interview. In this photo, Eric Church can be seen playing a Gibson Hummingbird acoustic guitar in Heritage Cherry Sunburst. In this picture Case can be seen playing a Hummingbird. In this photo, Schultz is visible playing Gibson Hummingbird. He plays a Gibson Hummingbird Standard, year is not determined. Used during this live show at Live X Studios. Visible throughout the music video for "Best I Ever Had", starting at 0:33. In this 2013 photo, Poulsen can be seen playing the Gibson Hummingbird. 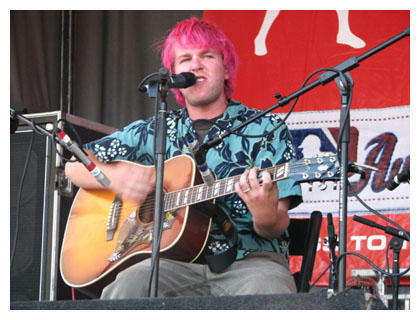 Shultz can be seen in this photo playing a Gibson Hummingbird. Played at the end of Season 3, Episode 24 of House, M.D. ID due to the plain bridge, three-point pickguard, and split-trapezoid fret markers. Supported by the fact that the character Gregory House continues to play only Gibson guitars for the rest of the show. 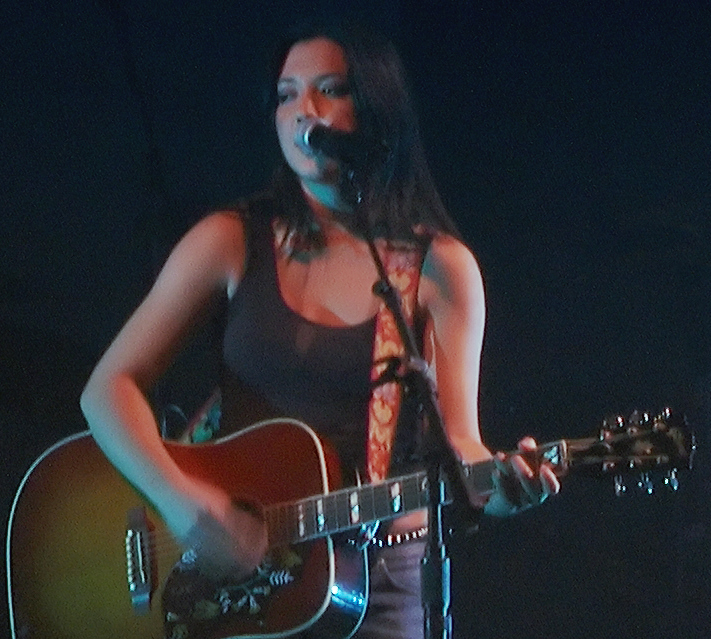 In this picture, Michelle Branch is performing at Toronto in October 2003 using a Gibson Hummingbird. Throughout this video (notably around 0:38), Tom Chaplin can be seen playing a Gibson Hummingbird. This guitar was setup and used specifically for the song The Frog Prince. This photo shows Cox playing a Gibson Hummingbird acoustic guitar. This guitar can be seen at many times during the video for Is it Done from his 2011 solo album Several Shades of Why. 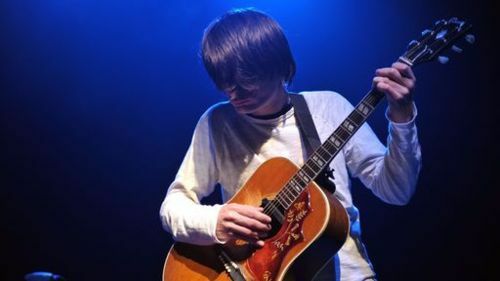 McCulloch is shown here playing a Gibson Hummingbird Acoustic-Electric Guitar. In this short video posted by Snow Patrol, Gary used Gibson Hummingbird in Emerald City Guitars. In this picture Fuqua can be spotted playing a Hummingbird. In this concert video Isbell can be seen playing a Hummingbird live. In this video, Eric Early can be seen playing Gibson Hummingbird. In this picture Merritt can be seen playing a Hummingbird on stage. I asked him what gear he used and this is what he replied. In This Video Of "School Of Seven Bells" Playing "Love Play". You Can See Benjamin Using A Gibson Hummingbird. At 1:23 Ian plays The Court Of The Crimson King. At 1:27, we see the whole guitar. The pickguard shape is of a Hummingbird design, and the headstock says 'Gibson', making this guitar an authentic Gibson Hummingbird. On his iTunes exclusive Acoustic EP, Mat is seen holding a Gibson Hummingbird acoustic guitar. 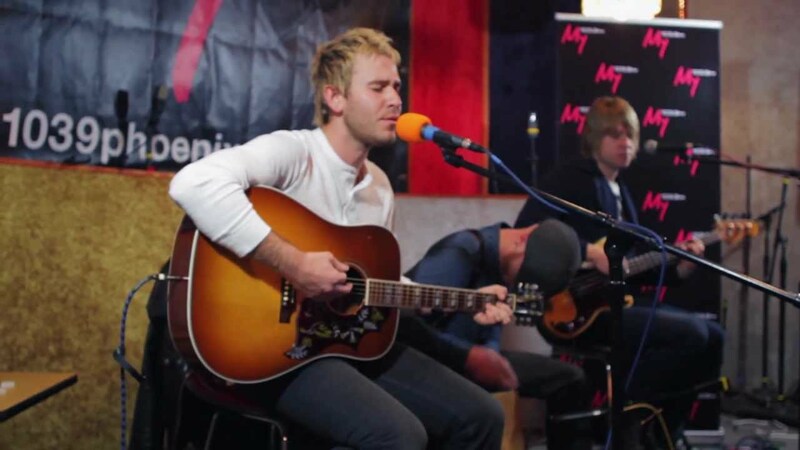 He often uses this guitar during Our Lady Peace's acoustic performances. Aimee Mann not only plays bass, also plays acoustic and electric guitars. 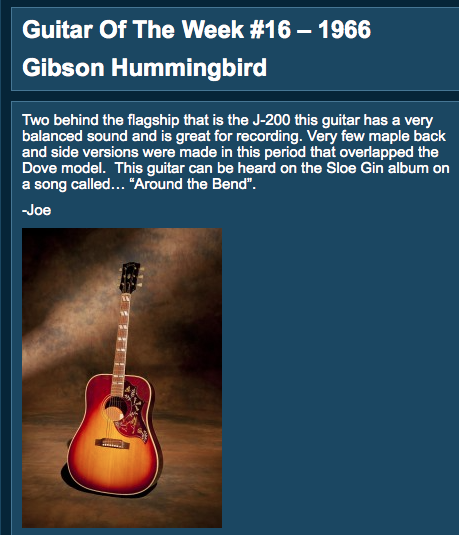 Grant has a 1992 Gibson Hummingbird as seen on the gear page of his website. In this Instagram post Yorn can be seen playing a Hummingbird. In this photo, which was taken by Rich Gabrielson, Stockdale is seen holding the Gibson Hummingbird. At 1:44 in this video, one can see Sweeney playing a Gibson Hummingbird. In this YouTube video, we can see Deryck playing Gibson Hummingbird. Charlie plays the Gibson Hummingbird. He was the only right handed guitarist in the band. You can see her play a Hummingbird in this picture. According to Premier Guitar, the orange-burst Gibson Hummingbird is one of his two Gibson Hummingbirds he uses on stage. He wanted a guitar that would be road worthy. Frank likes to move around on stage, and swing his guitar around. Other acoustic guitars he has used would get damaged more frequently. 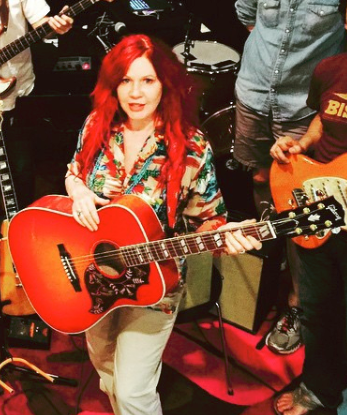 The photo shows Kate with a Gibson Hummingbird. I saw him using it in many videos alternating it with a Martin acoustic. On this Rig Rundown, Grace Potter talks about the acoustic guitar that she uses. This Hummingbird was gifted to her by Gibson as well as another 12 string. Matthew can be seen using a Hummingbird to record on 'Beautiful' and uses it for most of the "Smoakstack Sessions"
In this video for Cheap Girls's "Ruby", at the 1:09 mark, one can see Aymor playing a Gibson Hummingbird. He uses it for most of his acoustic songs. In this acoustic performance of Howl Alex Vargas can be seen using this Gibson Hummingbird, which was his staple instrument for many years until it was unfortunately stolen by a taxi driver in Las Vegas. 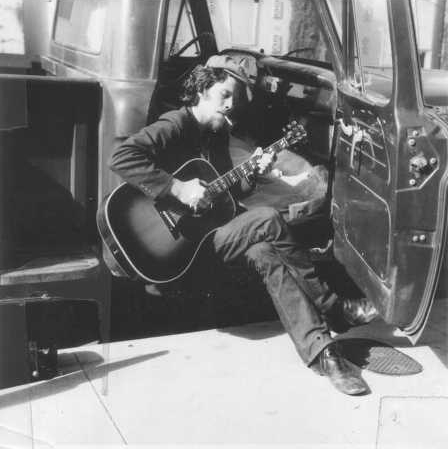 This guitar was given to him after departing his band 'Vagabond' in the earlier years of his career. At 8:30: Q:"And on the acoustic side?" A:"Hummingbird. I love my Hummingbird"
Pcitures of Shuggie Otis playing a Gibson Hummingbird are included as the album art for his album Insession Information. In this pic from the making of "The invisible", Mauro can be seen playing a sunburst Gibson Hummingbird. this image shows Dustin using this guitar during a show. It has very rarely been seen. On this picture Davie can be spotted playing a Gibson Hummingbird in 2015. In this photo of Maren Morris performing on The Tonight Show Starring Jimmy Fallon in June 2016, she can be seen playing a Gibson Hummingbird Ebony acoustic guitar. It is identifiable by the split-parallelogram inlays of the fingerboard, the ornate pickguard, and the Gibson logo on the headstock. In this instagram post by Joey he posted a photo of his Hummingbird capturing it by "beauty". You can see him playing it with a capo at around 3:59. It lists it on the second page, right hand side long with several of his other guitars. Visible in this live performance of her song "Goodbye May." During his performance on The Mountain Stage, Paul can be seeing playing his Gibson Hummingbird. 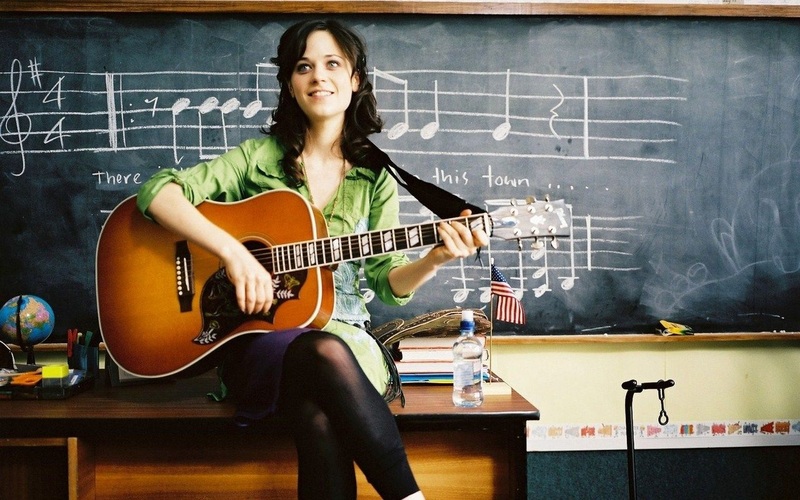 Barnes Courtney can be seen playing a Gibson Hummingbird acoustic guitar through the video for Fire. The Hummingbird From a company that has brought the guitar world so many great originals, the Hummingbird stands out strong and proud. Introduced in 1960 as Gibson’s first square-shouldered dreadnought, the Hummingbird arrived at the dawn of a new era in music, and was rapidly embraced by several prime movers on the scene. In the hands of everyone from Keith Richards to Gram Parsons, it quickly proved itself equally adept at folk, country and rock, and excelled at many of the crossovers genres in between that helped to set the scene for the ’60s. The action on this acoustic is to dream for. While many Martins and Taylors have the driving, gritty tone, my hummingbird has a great balance between bright and dark tonalities. Personally, this is the ideal fingerpicking acoustic, and like I said to start with, the action is superb. I play right at the edge of the sound hole towards the saddle to get a clear, yet warm-enveloping tone. I have written countless songs on this instrument because it is certainly inspiring just to own it and look at it. This guitar will last me a lifetime. She's finally opening up. Fundamental tone is all there. There are weeks this is the only guitar I play. i have the epiphone humming bird, but want the next step up!